Two Brahma golfers, Sahith Theegala and Jefferson Kao, who have signed national letters of intent. Shown with Coach Ty Watkins and Principal Catherine Real. Two Diamond Bar High School varsity boys golfers have signed national college letters of intent. Seniors Sahith Theegala will attend Pepperdine University and Jefferson Kao will attend University of California, Irvine in the fall. “It’s exciting and kind of unbelievable,” Kao said about the receiving the athletic scholarship. Kao and Jefferson have been varsity players since their freshman year. Theegala said he only needed to look at a few colleges before making his decision. “It feels awesome,” Theegala said after the signing day. “Pepperdine met all my requirements and the coaches are amazing,” the 16-year-old said. He’ll be 17 in a week. 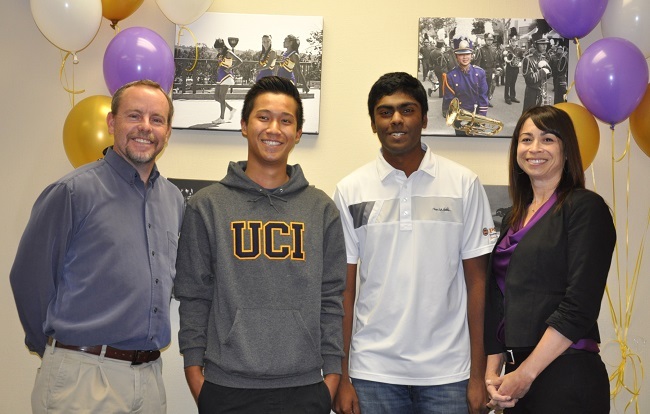 “The Diamond Bar Golf Program has had some great success over the past few years, mostly due to the great accomplishments of Sahith Theegala and Jefferson Kao,” praised Coach Ty Watkins. The DBHS Boys Golf Team were named 2012 League Champions, CIF Champions, 2013 League Champions, CIF Champions, and 2014 League Champions, CIF Runner-ups. The Nogales High School Noble Regiment took state championships this weekend — second year in a row, even when they moved up a division this year to 4A — beating 19 bands! 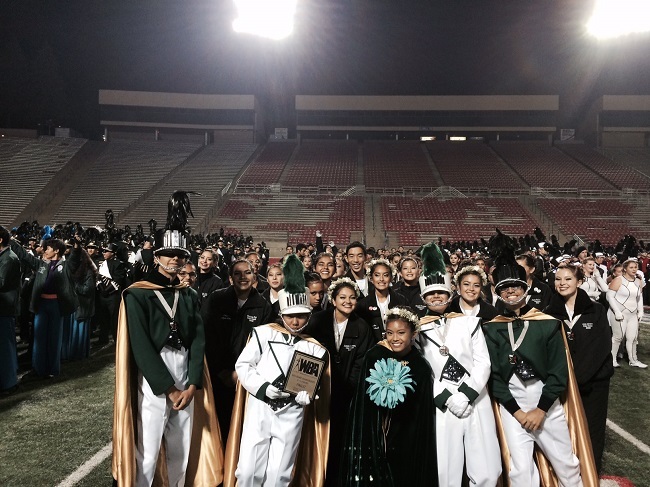 “Out of 20 bands, the nobles won general effect, visual, color guard and the gold medal. What an amazing experience and memory for our seniors and for our entire organization,” Pollock said. “I can’t say anything else but wow!! No words can express the emotions. I was more than proud of our kids, staff, parents, and we love our regiment family. Go nobles! !” Pollock said. The room was packed as GATE 4th-6th grade students at Shelyn Elementary presented their projects to classmates that they built at home that demonstrated their learning about “simple machines” and physics. After studying the many types of simple machines, students designed and built projects selected from different kits that were funded with grant money from the FOR US Foundation and The Shirley Kaufman Grant. “The idea was to promote to our students to be creative as they can. 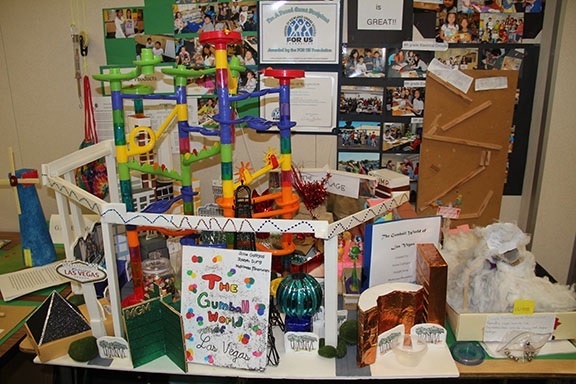 Even though they are simple machines, they are not so simple – everything from catapults, roller coasters and windmills were presented and on display and we were all so very proud and impressed with their efforts,” said Shelyn Principal Sarah Opatkiewicz. The community is invited to shop at Rowland Unified’s annual holiday boutique on Dec. 4 from 9 a.m. to 4:30 p.m. in the board room at the district offices on Nogales Street. Don’t forget if you want to order the popular Tamales, complete order form before Nov. 25 for pick-up at the boutique on Dec. 4. Some of the many hand-made items you will find at the Boutique are: holiday decorations, country and Victorian gifts, jewelry, doll items, purses, hair items, hats, duct tape crafts, Tupperware, books, knitted and crocheted items, sports novelty items, candied apples, pottery and tamales! Tables Still Left for Vendors! Yousef Nasouf is the new principal at Nogales High School. He comes from the Anaheim Union High School District, where he was Principal for Orangeview Junior High School since 2011. Before that , he was an Assistant Principal of Curriculum and Instruction for Cypress High School/Kennedy High School where he also coordinated the IB program. Nasouf taught eight years at La Mirada High School and was a Basketball Coach at Santa Ana College, Mayfair High School and La Mirada High. He holds a Bachelor of Arts in History from UCLA, and a Masters of Arts in Education from Cal State University, Dominquez Hills. For the past 44 years, Rowland employees celebrate the holidays by supporting the HOLIDAY BASKET PROGRAM which helps nearly 250 RUSD families in need. This donation is carried out through the joint efforts of the students of Nogales, Rowland and Santana High School’s Interact Clubs, ASB, employees of RUSD, members of the Walnut Valley Rotary Club, and other community volunteers. Please make checks payable to HOLIDAY BASKETS. You may make your voluntary contribution directly to your immediate supervisor now until Friday, December 5. All proceeds will be collected by Rita Garcia, Executive Secretary, Administrative Services in the District Office. (Letters with additional information were sent to all sites). Canned Goods are being collected at school sites for the baskets now untilWednesday, December 10. Richard Martinez, superintendent of the Pomona Unified School District, has been selected by the U.S. Department of Education as one of 100 top school leaders from across America to participate in the first-ever National Connected Superintendents Summit, on Wednesday at the White House. Superintendent Martinez is among exemplary local school chiefs who will be recognized for their leadership in helping transition their districts to digital learning. This unique conference will bring together officials from throughout America to share with one another and the Education Department promising approaches to using technology in classes. The Pomona Unified School District recently won two Golden Bell Awards from the California School Boards Association for its innovative use of technology in Early Childhood Education, and educational excellence at the Palomares Academy of Health Sciences. The school district offers its students career pathways in computer science in partnership with Harvey Mudd College and Microsoft Corp., and courses in robotics through Cal Poly Pomona. Village Academy High School offers career courses in Film Studies and Computer Science/Information Technology. Every PUSD classroom has Internet access districtwide. Thirty-two Common Core/SBAC assessment-ready labs are being completed and campus-wide WiFi is expanding at all sites across the district. Mobile devices such as iPads, Chromebooks and laptops are available in PUSD’s K-12 schools, bringing educational technology into the classroom. Through community partnerships with EveryoneOn and Southeast Community Development Corp., PUSD is bridging the digital divide for Pomona USD families. The White House summit will be followed by a series of 12-15 regional summits that will focus on the digital progress made possible by local school districts. The events will also include the unveiling of digital tools that facilitate incorporation of technology into short-term and long-range education planning. 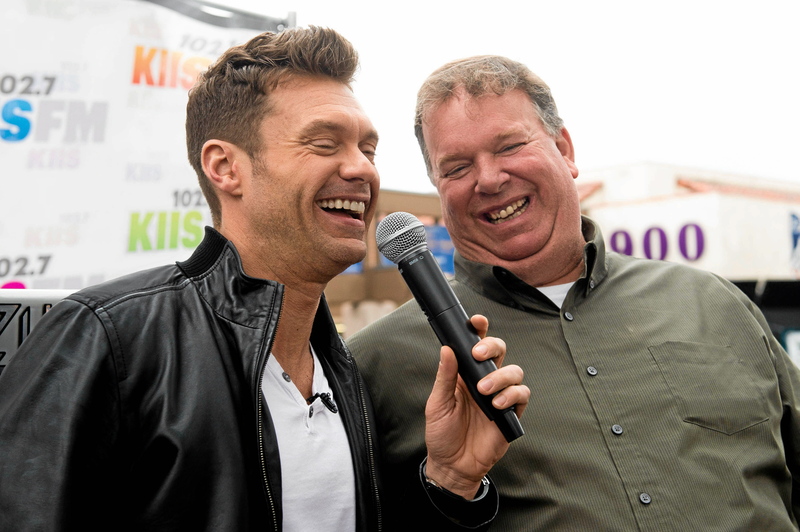 American Idol host Ryan Seacrest, left, celebrates with Diamond Bar High music director Steve Acciani. “American Idol” star Ryan Seacrest visited Diamond Bar High on Veteran’s Day to honor Music Director Steve Acciani, a semifinalist for the Grammy Music Educator Award. The event was hosted by KIIS FM, which kept the students and families entertained while they waited for the television star to arrive. Seacrest is an honorary chairman for the Grammy Foundation. He took time from his hectic schedule to meet one of the 25 national semifinalists. Music Director Buddy Clements at Walnut High is also a semifinalist. The award recognizes outstanding music teachers who have made significant contributions to music education. The gregarious teacher had to fight his way through the crowds to get to the stage when Seacrest called out his name. It seemed like all 700 students in the Brahmas music program showed up for the event. Read more in Rich Irwin’s story IDOL. Please join American Idol’s Ryan Seacrest, The Grammy Foundation, KIIS FM, and the Ford Motor Company to celebrate Diamond Bar High School’ Steve Acciani being named a national semifinalist for the Grammy Music Educator Award on Tuesday, November 11. Come and help support the Diamond Bar High School Music Program! Diamond Bar High School will be participating in the Ford Motor Company’s Drive 4 UR School national test drive program to help raise money for the school’s outstanding music program. GRAMMY Foundation Honorary Chair Ryan Seacrest will be on hand to join members of the Diamond Bar community who participate and support DBHS by test-driving a new Ford vehicle. 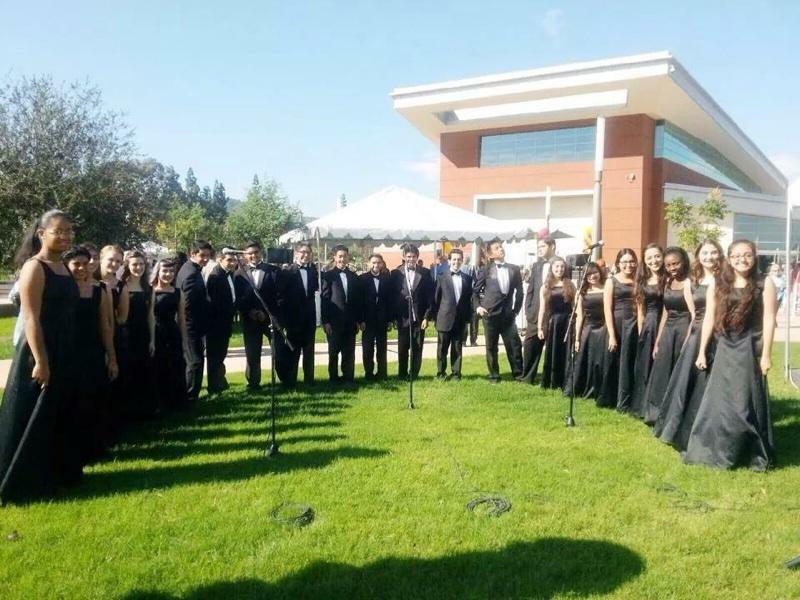 For every person over 18 who test-drives at this one-day event, Ford Motor Company and Fairway Ford will donate $20, up to $6,000, to Diamond Bar’s music education program. The event will also feature all 700 DBHS instrumental music students performing, and be hosted by KIIS FM. The event will take place on Tuesday, November 11, from 11:00am until 5:00pm, with Ryan Seacrest expected to join the celebration from 1pm until 3pm. Food trucks will be on hand, so come spend some time enjoying an afternoon out with the community.